Try the pasta with breakfast ingredients in Rome! 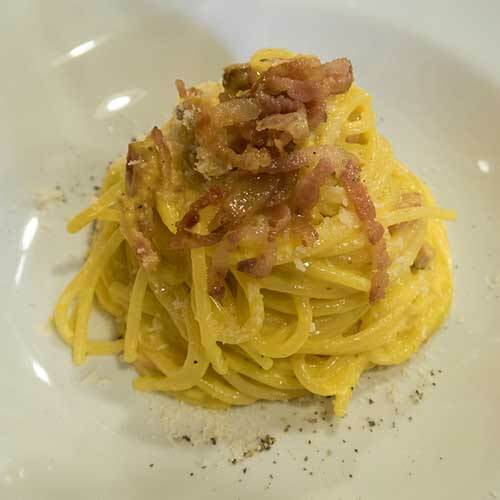 This is a simple dish popular in Rome that seems to have cut loose from its moorings with a worldwide frenzy to duplicate its simplicity badly. A well-made version is creamy, but no cream is used. Bacon, especially the industrial, uncured junk bacon in the US, is not a substitute for guanciale, the cured pig cheek the recipe calls for. Some restaurants will use pancetta in place of the guanciale. Pasta is cooked in abundant, salted water while the guanciale is chopped and sauteed in olive oil with garlic and a bit of parsley if you like. The eggs are whipped with grated pecorino. The key to the creaminess that Italian chefs and grandmothers know is that you must whip furiously these two ingredients to make it work. Then the pasta is tossed with the sauteed bits and put into a bowl and the egg and cheese mixture is added, stirred and cooked by the warm pasta. Add some coarsely ground black pepper for the “carbone” or charcoal effect. English Name: Spaghetti with eggs and "bacon"